In a public presentation livestreamed online from the 50th Lunar and Planetary Science Conference in The Woodlands, Texas, scientists on NASA’s New Horizons team speculated as to the origins of the Kuiper Belt Object’s surface features and markings, as well as its unusual and unexpected shape. In addition to being the farthest object ever explored by a spacecraft and the first primordial contact binary object ever studied up close, Ultima Thule continues to puzzle scientists with its strange shape. Stern was one of five mission scientists on the March 18 panel, which presented a live update of the latest discoveries about Ultima Thule. The other panelists included New Horizons science team member Carly Howett of SwRI, New Horizons co-investigator Silvia Protopapa of SwRI, New Horizons post-doctoral scientist Kirby Runyon of the Johns Hopkins University Applied Physics Laboratory (JHUAPL), and New Horizons co-investigator William McKinnon of Washington University in St. Louis. Michael Buckley of JHUAPL moderated the discussion. Scientists believe Ultima Thule’s two lobes were originally separate and orbited each other before finally undergoing a “gentle” merger that did not involve an impact. The lighter-colored “neck” that holds the two lobes together is a relic of the ancient merger, which took place during the solar system’s earliest era of accretion and planet formation. Markings on the “neck” could hold clues to the merging process. 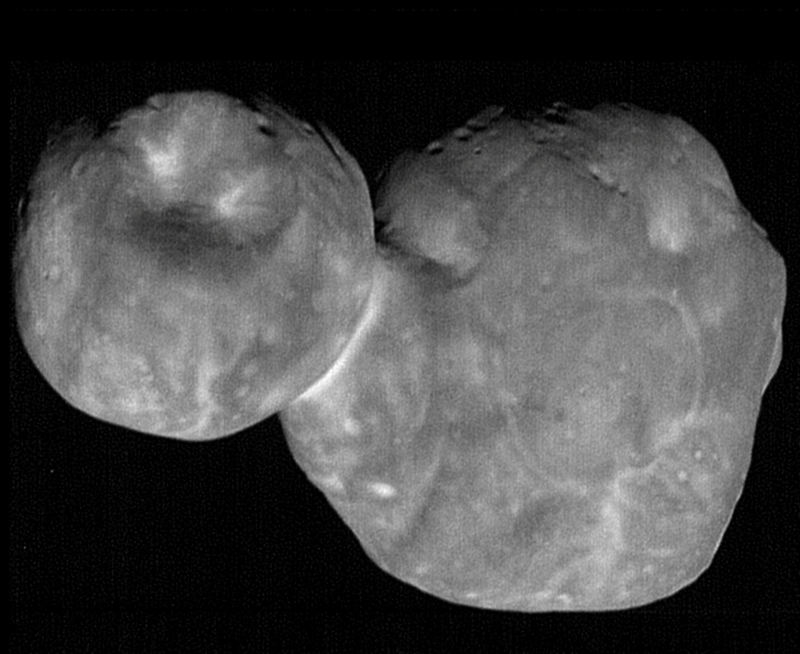 While current available data shows no sign of Ultima Thule having any satellites, the majority of the flyby data is still on the spacecraft, and mission scientists are not ready to rule out the existence of one or more small moons. Ultima Thule’s surface features include bright and dark patches, hills, troughs and craters. Its largest crater, nicknamed “Maryland Crater,” is located on the smaller lobe and has a diameter of five miles (eight kilometers). Mission scientists are uncertain as to whether Maryland and the smaller craters formed via impacts or through internal processes. Pit craters, for example, are formed when ice sublimates directly into gas, leaving pits behind, as well as when materials on the surface drain into subterranean cracks. Like Pluto and many smaller KBOs, Ultima Thule has a red color, which scientists first observed using the Hubble Space Telescope. Its red color is darker than Pluto’s, typical for KBOs in Ultima Thule’s region, which is known as the “cold classical Kuiper Belt.” Objects in this region have orbits that are largely circular; both their orbits and composition have stayed the same since the solar system’s earliest years. The red color is likely produced by tholins, organic compounds formed from the interaction of solar radiation with simple carbon-containing compounds, including carbon dioxide, methane and ethane, often combined with water and nitrogen. Ultima Thule has a spectrum much like that of other objects in the outer solar system and mission scientists have already found evidence the KBO’s surface contains water ice, methanol, and organic materials, Protopapa said. Using a sequence of images taken on approach to Ultima Thule, computer-generated images, and a parting view of the KBO captured just 10 minutes after closest approach, mission scientists created a short movie showing the target go from a dot in a star field to the now famous double-lobed object it is, to a crescent at the spacecraft’s departure. Queen guitarist and New Horizons team member Brian May added the soundtrack, which includes a quote by the late Stephen Hawking.